After a summer full of setbacks, existing-home sales made forward progress in September, indicating that the temporary effects of Hurricanes Harvey and Irma are starting to pass. However, the long-term lack of housing supply means that the increase in sales activity remains modest and fragile for the time being. 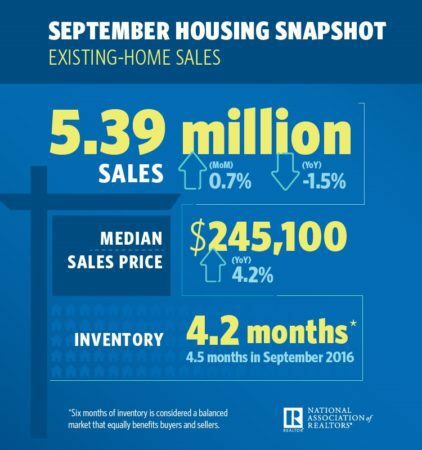 The National Association of Realtors’ (NAR) existing-home sales increased 0.7 percent to a seasonally adjusted annual rate (SAAR) of 5.39 million in September — up from 5.35 million in August. This month’s sales pace is 1.5 percentage points below September 2016 and is the second lowest SAAR sales pace seen in a year. The median existing-home price for all housing types in September rose 4.2 percentage points to $245,100, which marks the 67th consecutive month of year-over-year gains. Total housing inventory rose 1.6 percentage points month-over-month to 1.90 million homes for sale. Year-over-year inventory declined 6.4 percentage points and is in its 28th consecutive month of year-over-year declines. Unsold inventory is at a 4.2-month supply, a 4.5 percent year-over-year decline. NAR Chief Economist Lawrence Yun says the month’s existing-home sales decline is, once again, due to low inventory and rocketing home prices. “Home sales in recent months remain at their lowest level of the year and are unable to break through, despite considerable buyer interest in most parts of the country,” said NAR Chief Economist Lawrence Yun. “Realtors this fall continue to say the primary impediments stifling sales growth are the same as they have been all year: not enough listings — especially at the lower end of the market — and fast-rising prices that are straining the budgets of prospective buyers. “Sales activity likely would have been somewhat stronger if not for the fact that parts of Texas and South Florida — hit by Hurricanes Harvey and Irma — saw temporary, but notable declines,” Yun added. Distressed sales, which include foreclosures and short sales, were at 4 percent — unchanged from last month and a year ago. Three percent of September sales were foreclosures, and 1 percent were short sales. Single-family home sales were at a SAAR of 4.79 million — a 1.1 percentage point month-over-month increase and a 1.2 percentage point year-over-year decrease. The sales price for single-family homes increased by 4.2 percentage points to $246,800. Existing condominium and co-op sales decreased 1.6 percentage points to a SAAR of 600,000 units, 1.6 percentage points lower than a year ago. The median existing condo price in September was $231,300 — up 4.1 percentage points from 2016. In the Northeast, existing-home sales were unchanged at an annual rate of 720,000, down 1.4 percent from a year ago. Median price: $274,100, a 4.8 percent year-over-year increase. In the Midwest, existing-home sales increased 1.6 percent to an annual rate of 1.30 million. Median price: $195,800, a 5.4 percent year-over-year increase. In the South, existing-home sales decreased 0.9 percent to an annual rate of 2.13 million. Median price: $215,100, a 4.6 percent year-over-year increase. In the West, existing-home sales rose 3.3 percent to an annual rate of 1.24 million. Median price: $362,700, a 5.0 percent year-over-year increase.